So much of today’s press seems to be about the “right to die” or “dying with dignity” movement. We get caught up in the hyperbole of words like “physician-assisted suicide” or “euthanasia.” I believe that focus misses some very important points that are beneficial to every person who faces death (their own or that of someone they love). I prefer to focus more broadly on the right to decide, the right to participate, and the right to be prepared. Since no one knows when a personal medical crisis, traumatic accident, or terminal diagnosis will happen, it’s imperative that we begin meaningful conversations with people we love while we’re healthy and able to communicate. It’s important that we speak with our healthcare team (whether that’s our primary care/family doctor or a whole team of specialists) about risks/benefits and options. 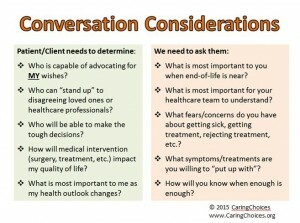 Waiting until we’re faced with a never-before-discussed situation is absolutely the wrong time to begin advance care planning or end of life counseling. At that time, we’re forced to make tough decisions in very limited windows of opportunity — when emotions are chaotic and reason is hindered. Negative emotions are mitigated when patient’s wishes are known. Caring Choices proposes everyone should have a “right to decide” what type of care they want and when they want it. We also believe that decision-makers have a right to be prepared to step in to advocate for a loved one who can no longer communicate their wishes. Family and friends have a right to participate in planning when a loved one asks them to be a caregiver. Stating that “my family will know what to do” or “my daughter will take care of me” are bold assumptions if you’ve never had conversations with or commitment from those you want as your decision-makers and caregivers. Consider the conversation(s). Then schedule time to have them. It’s your right … and theirs. Wendler, D. & Rid, A. (2011). Systematic Review: The Effect on Surrogates of Making Treatment Decisions for Others, Annals of Internal Medicine, 154(5), 336-346, W-100-W104. This entry was posted in Advance Care Planning on September 27, 2015 by Cindy Moyer.